Night After Night: The play's the thing. I get to see a lot of amazing things in my line of work, but it's hard to overstate just how excited I'd been all week long in anticipation of this afternoon's outing. Thanks to my much esteemed colleague The Determined Dilettante, I was able to attend today's matinee performance of King Lear, produced by the Royal Shakespeare Company at the BAM Harvey Theater in Brooklyn. As everyone in New York knows, this lengthy run has been completely sold out for months, mostly due to the presence of Ian McKellen in the title role. Also of note, the production was directed by Trevor Nunn, auteur of megabuck spectacles such as Cats and Les Misérables. Planning ahead to make the most of my experience, I spent every spare minute of the week poring over the lengthy commentary by R. A. Foakes in the Arden edition of King Lear, boning up on the various textual discrepancies and the divergent philosophies with which the play has been presented over the years. I also intentionally skipped reading any reviews, in order to come to the production completely fresh and with an open mind. I'm happy to report that my enthusiasm was largely warranted. What was best about this Lear was the strong acting. McKellen offered a brave, powerful account of a headstrong monarch accustomed to solving problems through the application of force. Slightly doddering and infirm from the beginning, McKellen's Lear makes snap judgements that in the end cost him everything. His exchanges with the Fool, played by Sylvester McCoy as an aged wiseacre, were sharply pointed, and his mental breakdown -- including the much-reported (I now know) scene that might be called "Sir Ian McKellen: Uncut" -- was harrowing: a naked depiction of a fleshy sack bereft of all reason. 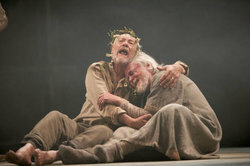 Lear's reunion with Gloucester, his reconciliations with Cordelia and Kent, and his end were all utterly heartbreaking. On a par with McKellen's titanic assumption were the performances of William Gaunt as a noble Gloucester, Jonathan Hyde as the earnest Kent and Julian Harries as an Albany whose transformation from milksop to penitent crusader was compelling. Ben Meyjes brought a live-wire intensity to his portrayal of Edgar/Tom of Bedlam that weirdly enough reminded me of Nicolas Lea's Alex Krycek in The X-Files -- which is a compliment, mind you -- in that even as a victim, Edgar always kept his wits about him, and seemed genuinely capable of assessing a situation and exerting influence over his fate. As Edmund, Philip Winchester was a handsome conniver whose scenery chewing was, perhaps strangely, impossible not to enjoy. Less sympathetic in their villainy were Frances Barber's Goneril, largely a shrieking harpy, Monica Dolan's oddly slutty Regan and Guy Williams's Cornwall, who clearly aspired to Lear's initial boorishness. These, you could say, were strong performances within the confines of directorial limitation. Romola Garai's Cordelia was beautiful to look upon, but hardly broadcasted the mettle it would take to lead the French army against her sisters. Where this Lear rang most untrue was in some aspects of Nunn's staging, which often played rather obviously to a Broadway blockbuster mentality. The Cossack garb, whether it was a bizarre attempt to link Lear to the company's concurrent production of The Seagull or simply an excuse to inject a lot of noisy gunplay, was puzzling to say the least. The overly loud music, composed by Steven Edis, was slight but generally dismissable, apart from bombastic organ cues that led you to think a chandelier might fall from the ceiling at any moment. The tempest registered more as a gentle rain storm; it looked quite good, actually, but the shattered rafters at the close of the scene seemed like pandering. On the other hand, the Fool's hanging was genuinely creepy -- particularly since it happened immediately before intermission, which meant that as you left the theater, you couldn't avoid awareness that you were turning your back on a dangling human body. (It provided a measure of relief to see the actor helped down when I was halfway up the stairs.) I can't imagine a more gruesome depiction of Gloucester's blinding. I'll also single out Malcolm Ranson for his genuinely effective fight choreography: the final duel between Edgar and Edmund, in particular, was visceral, balletic and utterly thrilling. On balance, this was a production in which the positives far outweighed the negatives, frequently rendering the kind of "we're all in the same room" ritual power that makes live theater at its best a mind-altering substance. 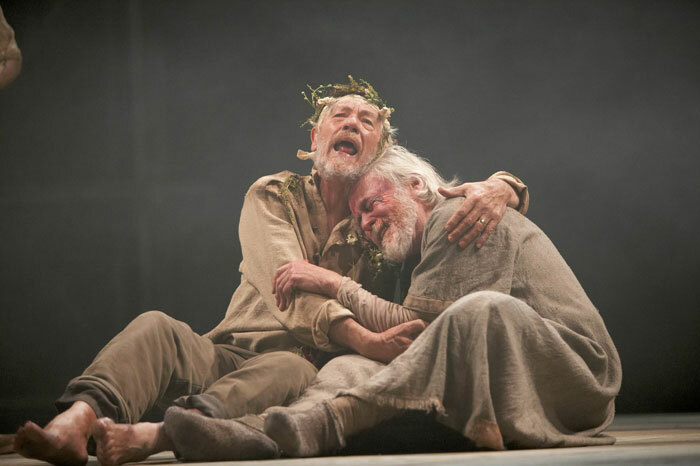 I feel lucky to have seen it -- and the scenes between McKellen's Lear and Meyjes's Edgar-as-Tom made me want to see these two as Prospero and Caliban, respectively. Afterward, I headed back to Manhattan for a performance by saxophonist Sam Sadigursky, who presented a record-release show for his Words Project at the Cornelia Street Café. I've previously blogged about Sadigursky's disc (recently issued on Judd Greenstein's New Amsterdam label) here, and also reviewed it for Time Out New York. At Cornelia Street, he led a group that included pianist Pete Rende, bassist Eivind Opsvik, drummer Bill Campbell, and vocalists Becca Stevens and Monika Heidemann. Impressively, Sadigursky didn't just trot out tunes from what I considered to be a successful, substantial record. During the set I saw, most of the material was new. 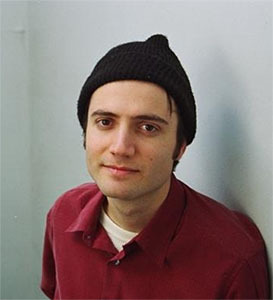 True, the performances of "Gardener and Flower Too," "Still Life," "I'm Glad Your Sickness" and "Love," all on the CD, were the more technically polished moments. "Love," which closed the set, was especially powerful, melding Stevens, high and light, and Heidemann, lowe and dusky, in solo passages and non-quite-canon echoes. But the new material -- settings of "To Drive a Nail" and "Paths" from Andrew Boyd's Daily Afflictions, as well as David Ignatow's grody "No Theory" and Bertolt Brecht's epigrammatic "Motto" -- proved the Words Project to be a growing concern rather than a done deal. The two singers gave Sadigursky ample resources with which to contemplate texts that ranged from sentimental to absurd. His settings provided strict, angular melodies that the singers had to navigate like horn players; conversely, his saxophone solos offered the kind of flexible elaborations that one might expect from a vocalist. The rhythm section was always supportive, and Rende proved an exceptional soloist through his enigmatic, introvert turns of melody and harmony.